Banglarbhumi LR-RS Plot information is a service that helps the user to know the information about the certain plot by requesting the status. To Know about the plot information request, you have to follow the below steps carefully. Similarly, All property owners in the state follow simple steps to learn about downloading their Mauza map using their bbanglarbhumi LR-RS Plot Information. West Bengal through the Directorate of Land Records & Surveys maintains and updates mauza maps (Cadastral Maps) and Records of Rights for over 42,000 mauzas in the State. Due to operationalisation of all blocks in the state, Certified Copies of Records in pre-printed stationary are being serviced quickly from BL&LRO offices. 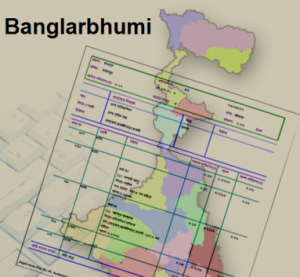 Check your Banglarbhumi LR-RS plot information? All the citizens and Landlords can get complete information with maps to RS-LR Plot number, Khatian no from the Banglarbhumi website. Visiting the authorized website makes it easy to get all the required information for any user. You can either go to the Banglarbhumi website or wbregistration website. You need to select the DLRS or Citizen Services tab. Now select the RS-LR plot information from the loaded page. You can see the fields like District, Block, and Also Mouza. Select your district name, block name, and mouza name from the list of options. Choose your required option and enter the respective Plot No. Click on the submit button. finally , you can find all the required information about RS-LR plot. You can take a print of this information for further use. Facility of Certified Copies of pre-printed legal authority copy’s will get nearest BL&LRO office in your circle means West bengal, and the certified copy of maps (West bengal Mouza maps) available with sign and stamp assisted by issued authority in west bengal, those certified copy’s are accepted for legal use across in the country. this copy is called “Banglarbhumi.gov.in Certified Copies of west bengal land Records“. Finally, To know about Banglarbhumi Khatian & Plot Information / RS-LR information, you need to visit the official website : http://banglarbhumi.gov.in/eDSS/indexAction.action.